Pesto is one of the only green in color foods I can get my kids to eat. So I especially like to hide a leafy green veggie in it! I’ll use anything from Arugula to Mizuna to a touch of baby Kale and Spinach. They have no clue. They love it and ask for it all the time. I typically make it once a week so we have it for pasta one night and on a homemade pizza another night. Rolled out dough, topped with halved cherry tomatoes and baked. We then throw on some raw cashew cheese on top as soon as it comes out of the oven. 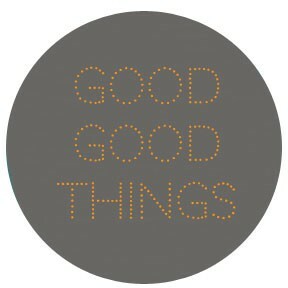 Its great. I personally like to to save some for Roasted Vegetable Sandwiches. 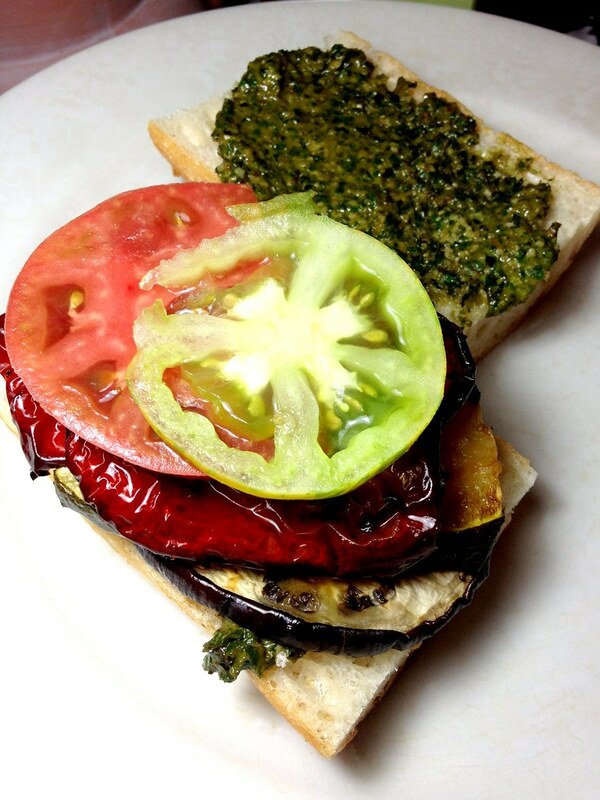 I could eat these sandwiches all summer long. There is also sometimes pesto eating before a pesto dinner. I get hungry while I’m cooking. I generally always made our pesto in a food processor but, sadly, part of it broke and I still haven’t ordered the replacement part. 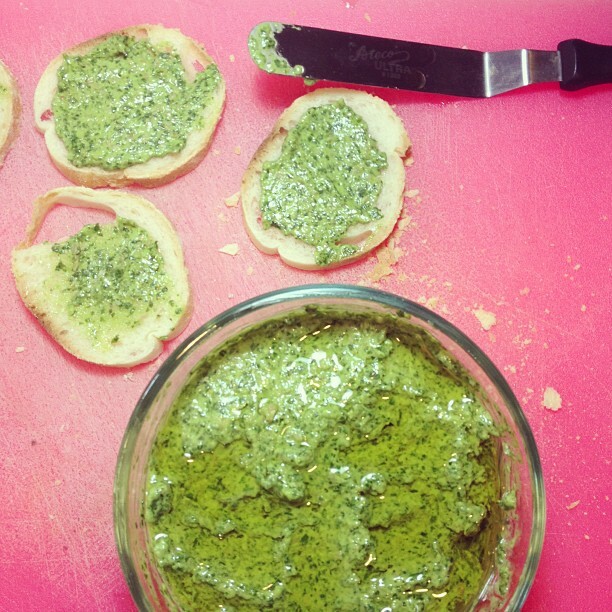 All of our pesto is now made in our Vita Mix. The processor makes it chunky, which I prefer. The Vita Mix makes the pesto smooth, which is also ok. It just depends on what you like or which appliance is working and which isn’t! 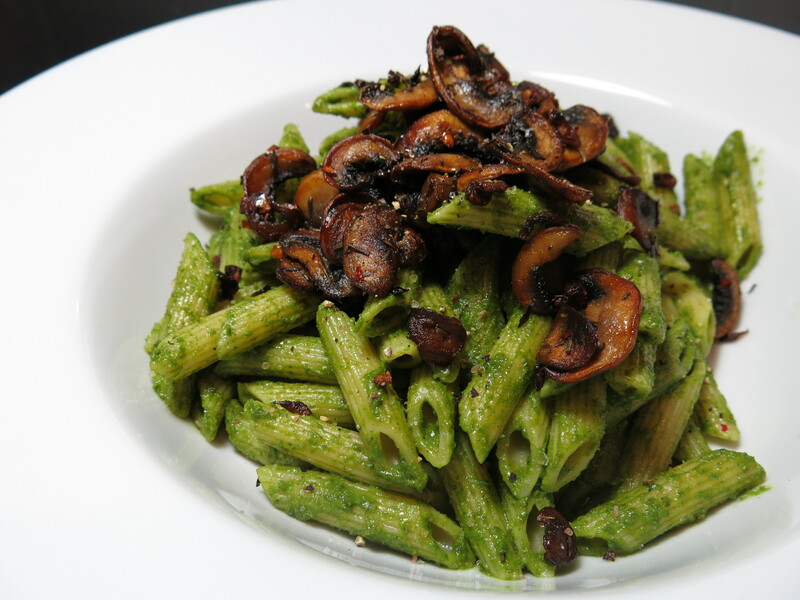 Traditionally pesto is made with pine nuts. I’ve given up on pine nuts since having a good ol’ case of pine mouth a few years back. It was terrible. My mouth tasted like metal for days. Right not my favorite nuts and seeds to use are: almonds, cashews, sunflower seeds and pumpkin seeds. Seeds being my favorite since I like to keep my daughters school lunches nut free. Feel free to experiment with any nut or seed you like. What’s also traditional in pesto which is a concern for vegans or those that are just dairy free is cheese. I found the best way to replace the cheese in this recipe was to use miso paste! 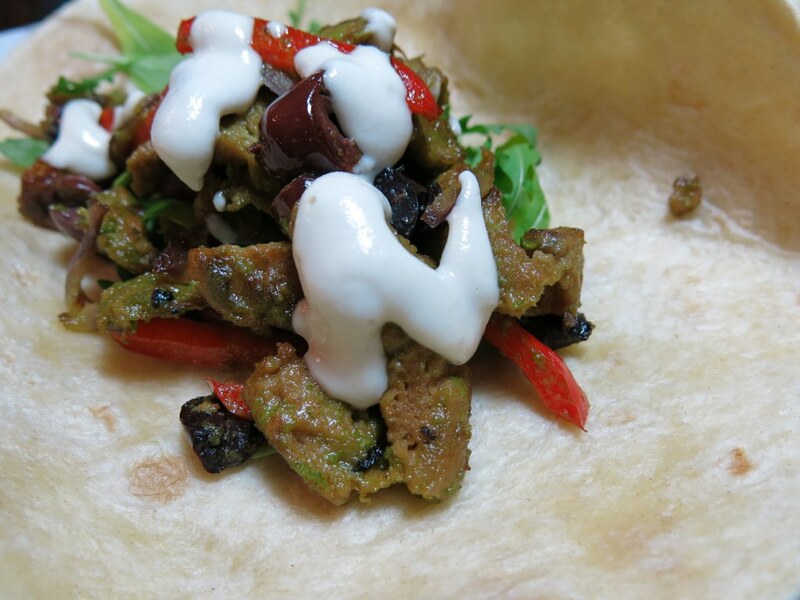 We think it’s a perfect substitution and it’s quite healthy for you also. A good Mellow Miso is easy to find in well stocked supermarkets. Add all ingredients and blend until combined. Salt to taste. If it's thicker then you would like then drizzle in some more olive oil. Pulse seeds and garlic until finely chopped. Add basil, spinach, mellow miso paste, agave syrup and blend. While the machine is running slowly pour in the oil. Blend until combined, stopping to scrape down the sides of the bowl a few times. Season to taste with salt. Experiment! Try different nuts and seeds! Try different leafy greens but always use basil! Enjoy! Cashews are hands down one of my top 5 favorite foods. Not just favorite nut but favorite FOOD’S! I love eating them raw, roasted and salted. I add them to stuffings, chili’s and stir-frys. Forget tofu ricotta I make cashew ricotta. My favorite morning cereal is a store bought granola with cashews in it. The big container of mixed nuts we buy is all out of cashews long before we reached the halfway mark of the container to the annoyance of many. I’m surprised I don’t make my own or even buy already made cashew milk. I might have to try that! 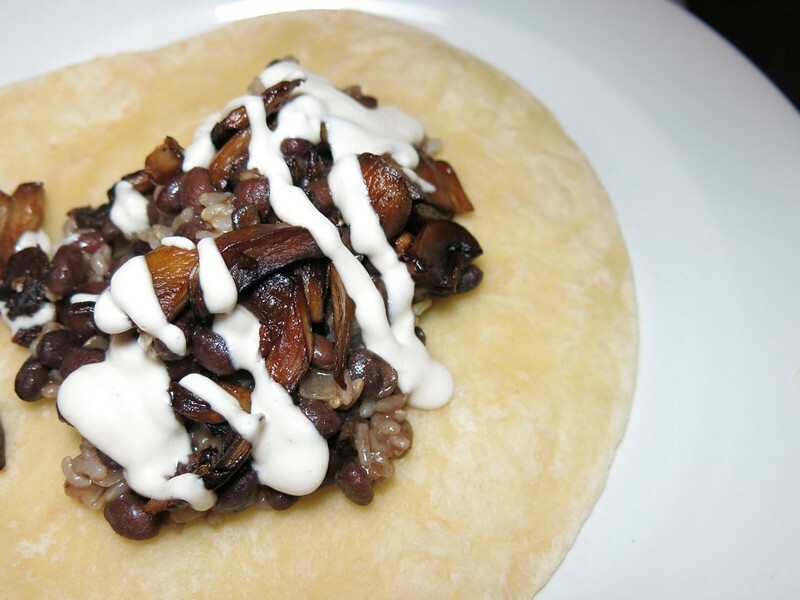 Whenever I feel a meal needs a creamy condiment I whip up a fast Cashew Cream. Since I use a Vita Mix I don’t need to soak my cashews first so this is often a last minute type of thing for me. The table is usually set with the dinner on it and by the time I get the other 3 people in my family at the table and ready to eat I can hop back into the kitchen and have this ready in less then 1 minute. I use this Cashew Cream on wraps, sandwiches, soups, stews and chili’s. I even make a batch of it the night before we leave for our annual summer beach vacation to use while in our rented beach house. I hope you enjoy it as much as we do! Add all of the ingredients into a high speed blender and blend until smooth. Add more water a teaspoon at a time if needed. I mentioned a month ago how my darling husband gifted me with a machete for my birthday. Just so I can open young coconuts for him and the kids. How sweet of him to be thinking of me. The whole machete thing has been working out though. Once every week or two he takes it out of the closet and hands it to me to open our latest coconut that the kids begged me to buy at Whole Foods. The thing cuts through coconuts like a dream. Drinking the coconut water from an actual coconut instead of the tetra packs of them is 10x better tasting. My problem has been what to do with the young coconut meat that is left inside. I don’t like it as is. It has to be turned into something and my first though was why not a pudding? We love pudding and most of the time I made a chocolate coconut pudding out of canned coconut milk so why not use this fresh coconut meat? I set out one night to make it and it was perfect. The second time I made it it was perfect again. 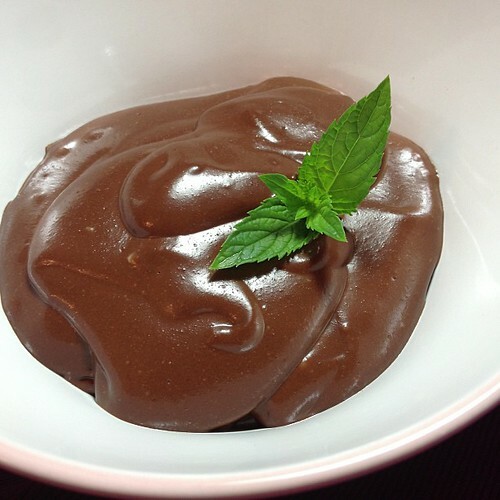 The kids get so excited now at the though of this Almost Raw Chocolate Coconut Pudding. Here is our recipe! coconut water to blend. I start with 1/4 cup. Combine all the ingredients in a high-speed blender and blend until smooth. Transfer to a bowl and cover with plastic wrap pressing it against the pudding so it doesn’t create a skin on top. Place in the fridge for a few hours or over night until thoroughly chilled. Serve and enjoy. I was never a fan of “real” pizza aka tomato and cheese. The cheese was always so gross and stringy. Even with the advances in vegan cheeses like Daiya and the new and improved Teese I’m still not much of a fan. 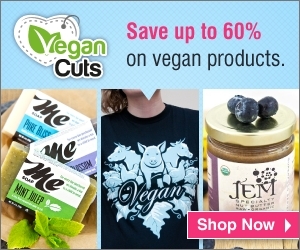 I like those brands of vegan cheese but not on my pizza! My favorite all time pizza is a new one for me. It consists of homemade Basil-Miso-Walnut Pesto, some homegrown still warm from the sun cherry tomatoes and a raw cashew cheese. Pop into the oven…400 450 degrees…whatever you fancy. 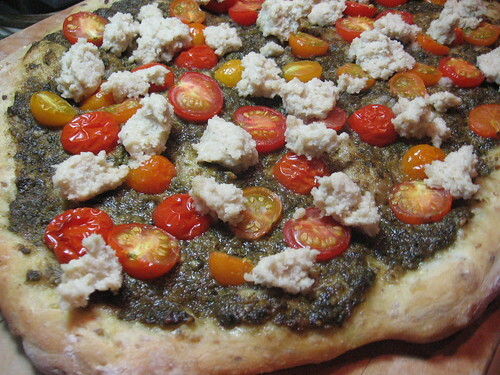 When the crust is nice and brown and the tomatoes are nice and bubbly take the pizza out and drop on the raw cashew cheese in random places. Its basically the best pizza ever. Peter and my Maa are hooked. Reno will just eat pieces with the tomatoes and cashew cheese taken off…she’s only 3 so what does she know..right? I insist that you all make this pizza. Your taste buds will thank you. p.s. the cashew cheese is from Ani Phyo’s new book: Raw Food Essentials. I’ll be posting a full review of her new book in a few days! There has been a few times recently that I needed to make a dessert or snack for a potluck or trip to a friends house. I was always delayed in figuring out what to make and before I knew it I had to leave for the event in less then a half an hour! One option when that happens is just to head to Whole Foods and pick something up. The other option, my favorite, is to make Raw Truffles. From start to finish they take maaaaaaaaybe 10 minutes and what’s even better than that is that I ALWAYS have the ingredients for them. The ones above are made by throwing a handful of raw pecans in a food processor and pulsing them until they are broken down a bit but not too much. I then add about the same amount of pitted medjool dates, a few dashes of cinnamon, a few tablespoons of raw cacao powder and a tablespoon or two of water or juice and blend away until all the ingredients are combined. If it’s not blending well or the ingredients keep getting stuck I just add more water or juice to help get it going again. Once everything is done I take a small cookie scoop and scoop up some of the dough into my hand and roll them into balls and place them into mini cupcake or candy liners that should be ready and waiting on a serving plate. Once all the truffle making is complete cover them with some plastic wrap and stick them in the fridge, taking them out 5 minutes before you are going to serve them. 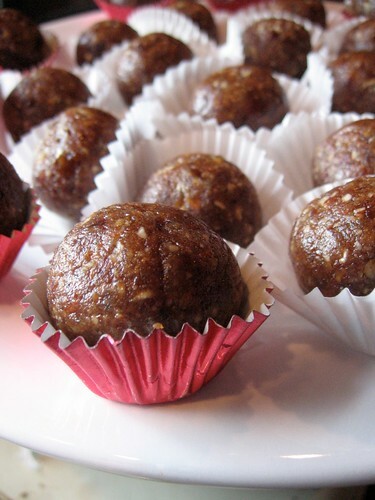 OR if you are anything like me lately just cover them while your running to your car hoping you won’t be too late for the vegan dessert potluck you just made these for! Now if you have all the time in the world to make these and want to make them extra decadent you can dip them in chocolate and place them on a parchment lined baking sheet tray, stick them in the fridge to set the chocolate and then drop them into individual liners. YUM!